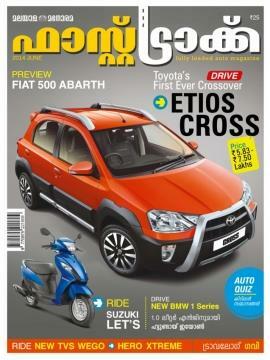 Fast Track malayalam magazine published by Malayala Manorama Group is a popular automobile magazine in India. Being one of the favourite magazine among the automobile lovers, Fast Track covers areas of interest on cars and two wheelers. Comparison of cars from different manufactures makes this magazine different from others in the same genre. Read more to know about Fast Track magazine. There are a number of periodicals available in the market for the automobile enthusiasts. To cater the need of the youngsters, Malayala Manorama has published 'Fast Track', a monthly magazine specially designed for the automobile lovers. Being one of the favourite magazine among the automobile enthusiatsts, Fast Track covers areas of interest on cars and two wheelers. Comparison of cars from different manufactures makes this magazine different from others in the same genre. As articles are written in simple language, even a common man can understand it. Details about the latest auto accessories and information about auto loan products from Banks and other financial institutions would give more insight for the readers who wish to own a vehicle. Fast track even covers latest news and reviews about cars, two wheelers and information about automobile industry in India. Designed to perfection, each issue of the magazine features interesting stories and photographs of the latest from the automobile industry. Printed in multicoloured papers, this magazine can keep the readers engaging till the end of the page. Comparison tests and test drive reports of latest cars and two wheelers are also featured in each issue. The travelogue published covering picturesque locations in India travelled in a selected car model is the main attraction of each issue. More than being a guide to those interested in travelling, the magazine serves as a companion. 'Fast Track' even shapes the traveling destiny of a person. Informative regular articles such as auto guru is dedicated for the readers, who could get answers for the questions related to automobile and buyers guide. More than a monthly on cars and bikes, Fast Track is a lifestyle magazine designed for the present generation. News about upcoming models can keep the young readers intact. Apart from road tests, its USP are surreal features and about driver interactions with the car is also discussed in this magazine. So if you wish to keep updated about the happening in the automobile world, Fast Track can be a perfect choice.